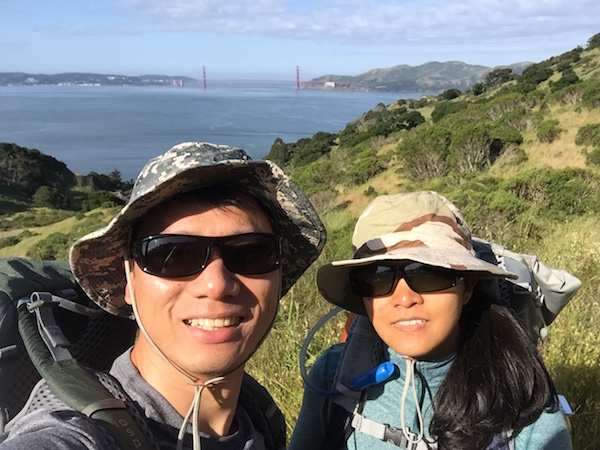 Very excited to kick off our journey in backpacking officially with Angel Island State Park! I was able to grab a campsite reservation on a Friday night. 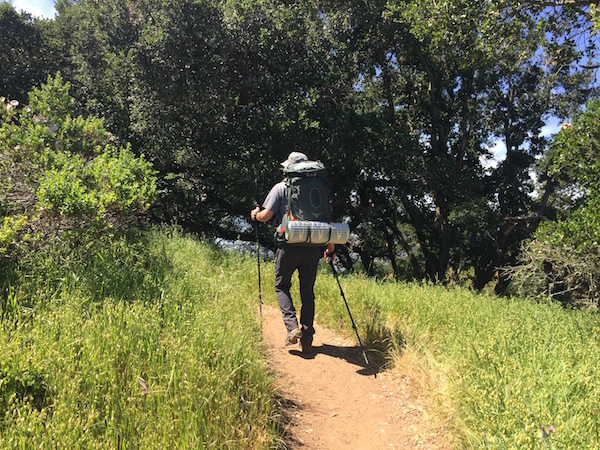 We had some gears, like backpacks, stove, sleeping pads, and were missing some critical ones, like a tent and a sleeping bag. I borrowed whatever we didn’t have from my co-worker. This would be our first time cooking & eating away from home. It was a good practice to have a checklist and check everything we prepared for this trip. We were ready to roll. We hiked about 10 miles in total from day one and day two morning. The terrain was very friendly for beginner backpackers. Not very steep nor long to reach places. I don’t remember the exact route we went, and maps below only roughly represented our routes. 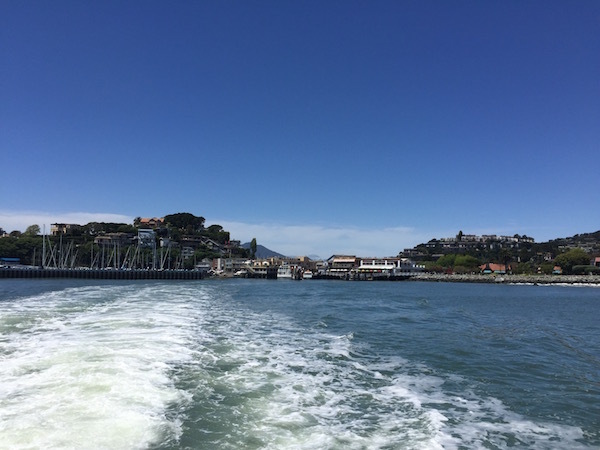 We almost missed our ferry to Angel Island. If we missed that one, we would have to wait for 2 hours to board the next one. Luckily, we got in. Lesson learned: give plenty of time for road trip, commute, etc, because you never know what the traffic condition is. We got to the island, checked in with a ranger. She told us to store all our scented items well, because raccoons were very active. We followed the North Ridge Trail to the summit of Mt. Livermore. Weather was great with lots of clouds. Not many people there on a Friday, so we enjoyed most of the hike by ourselves. 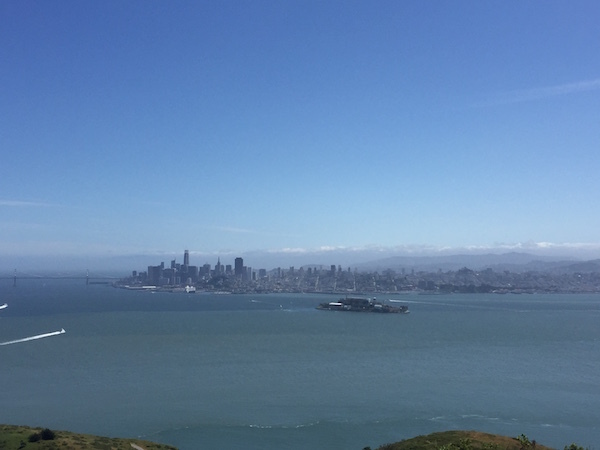 The view is very pretty — looking at San Francisco Bay Area from the top of Mt. Livermore. We came back down to hike to Sunrise Camp. The crossing was not well marked, but we were able to figure out based on a paper map the ranger gave us. It was called Sunrise Camp, but actually not marked so at the campaign. Sunrise Camp refers to Campsite 7, 8, and 9. We were there at the camp almost too early. We pitched our tent and began to cook dinner. 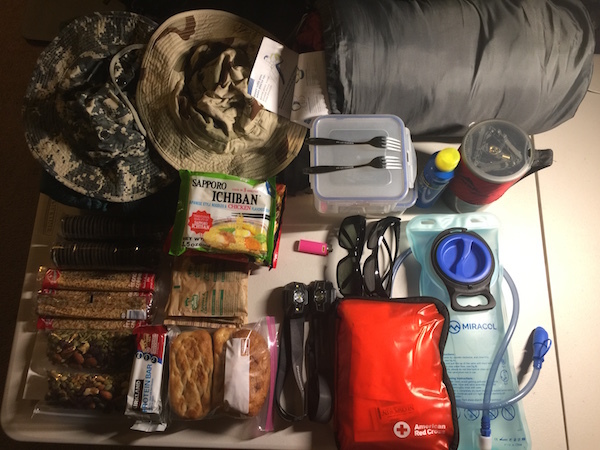 We didn’t know what to bring for food, so kept it simple: protein bars, trail mix, Oreos as snacks, some floppy bread and instant ramen noodles for dinner, instant oatmeal for breakfast. We also bought a few small oranges to add some happiness to our trip. I thought I would be happy with ramen noodles, but I was wrong. I don’t eat them that often, but when I eat, I boil them at home, adding an eggs and some veggies and I loved the taste. Not the case in the camp, no luxury items like eggs or fresh veggie. It was not fuel smart either if we just let the noodles boil on our little stove. Thus, we boiled water, pour it into noodles in a sealable bowl and let them simmer. They tasted pretty boring… I broken bread into the noodle soup, ate them and drank the soup. When we got into our tent, it was around 7pm. 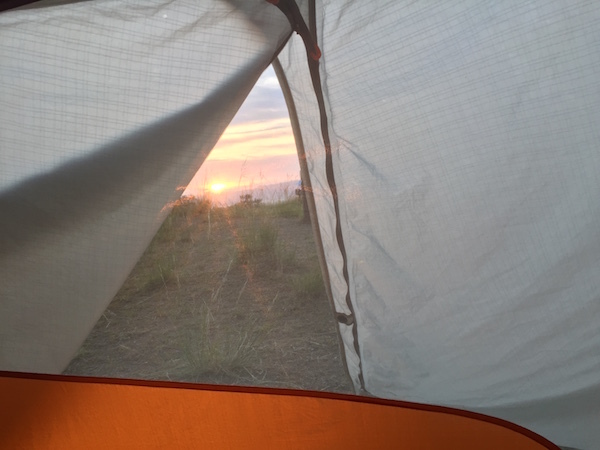 We lay down in our tent and listened to a bunch of podcasts downloaded beforehand. It was still very bright outside when we got tired of those podcasts. So we just talked to each other to pass time. The other two campsites were empty, surprisingly. I didn’t see any other availability other than our camp at the time of booking. Maybe they decided not to come. Maybe it was campsite traffic control? I didn’t know. I was glad we had a quiet area by ourselves, even though I could hear laughters from other campsites far away almost after midnight. Around midnight, my husband heard something coming by. 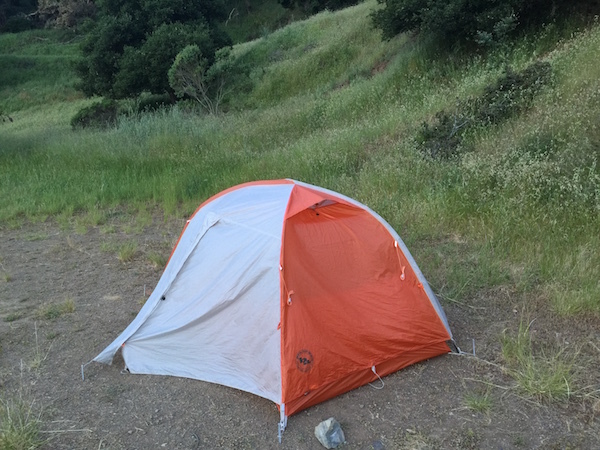 He unzipped the tent a little bit and suddenly stopped, and whispered to me that that thing came closer. We waited in silence for less than a min, and zipped it back. I thought it should have to be a raccoon, he probably wanted to know what the noise was – the unzipping. We fell asleep again, but not that deep anymore. We woke up around the time of sunrise. It was almost like that we owned the sunlight ourselves. At breakfast time, I looked at the leftover ramen noodles, thought I may as well just finish them — one less item to carry on the back. So I ate the same thing, exactly the same as my previous meal: ramen noodles and floppy bread in soup. Ugh! Why did I do that… I will not eat the same thing twice in row in my future trips. We decided to take the first ferry that leave the island at 10:20am. When we left, we almost had the morning hike by ourselves and later entire ferry to ourselves. 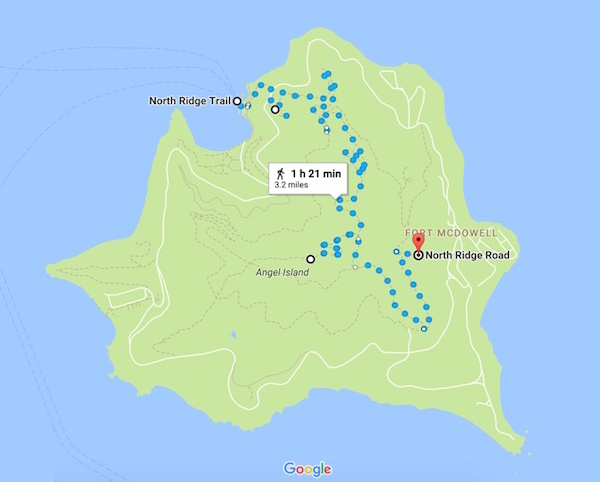 At that time, probably only rangers and campers were on the island. When the first ferries from San Francisco and Tiburon came in, two full loads of people landed. 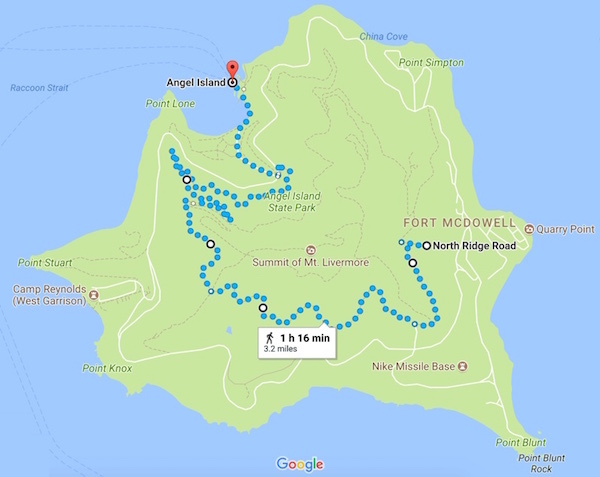 It would be a really packed day for the island. In contrast, we enjoyed the ferry by ourselves. We stayed one night at camp 9 (Sunrise Camp). It was great with a toilet and tap drinking water nearby inside the campsite. It was easily accessible by a fire road. 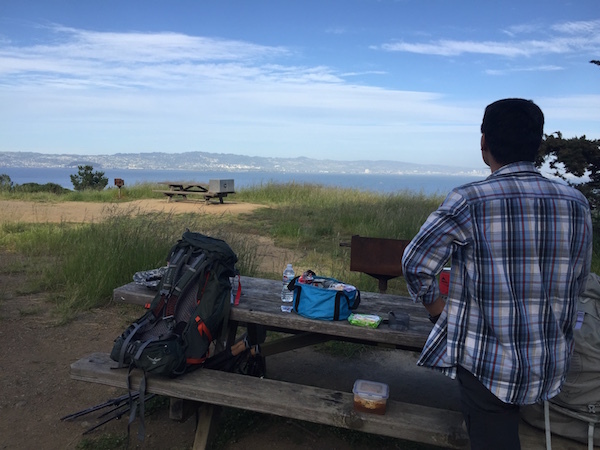 ← First-time Backpacking & Camping — Ever!